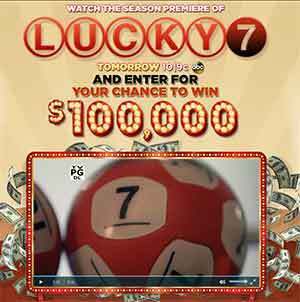 The lucky winner will receive an amount of $100,000 cash. 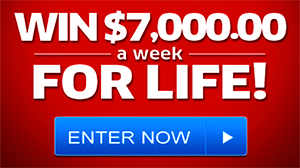 The ABC’s Lucky 7 Sweepstakes is open to US residents aged 18 and up. You can enter daily through September 24, 2013. Hurry up! This is ending tonight at 9PM. Note that when you enter, they will give you two random numbers, first a ticket number that you can see, and an entry identifier that you can’t see. So all you have to do is enter the contest and watch the serie premiere tonight on ABC. To enter visit today abclucky7.com official sweepstakes website and follow the on-screen instructions to be eligible for the drawing. Just imagine what you could do with this amount of money! You could use it to take a nice vacation, maybe invest in a new home, or perhaps make some new home improvement to your house. Some would probably invest it for their future retirement. Whatever the way you use it! It’s always a joy to win cash prizes! I have tried several times to enter my Activation Code: PC287, but cannot get into the link to enter. I also read several comments and saw that someone else has the same activation code as I was mailed in a W71 notice. Please see that I get entered into sweepstakes. I would love winning 100,000.00 so please help me to get entered. ABClucky 7 i like to win to buy my mother a house and get my family one too we need. A house bad thank you. Y I wanna win a big super prize.